Earlier this year, I’ve read and reviewed THE VISITOR, saying that it is the creepiest book in the series. I guess I talked too soon, because, lo and behold, THE SINNER is here and it gave me some really sleepless nights. For our Graveyard Queen, it has been a year since she (Amanda) and Devlin had a divisive comprehension -recognizing each other’s unnatural endowment- moving them at opposite poles. It’s helplessly sad because it is like witnessing something truly beautiful cracking in the middle. And in spite of the horrifying events at the Kroll Cemetery, Amanda still finds cemetery restoration her firm ground in mending her broken heart and refurbishing her balance. Now, Amanda has been called to Seven Gates Cemetery to solve the riddle of the twelve mortsafes and the body of a girl buried with her hands grasping the iron grate. The Graveyard Queen became one of my most favorite series. And now that we are down to the penultimate installment, I have these mixed feelings. I am absolutely excited to read the last book soon, but I am also torn by the fact that I don’t want to let this series end. Although, Ms. Stevens did promise an ebook that will feature Amanda and Devlin to introduce the new cast for her new series. 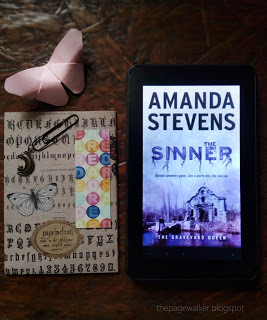 For now, though, I’d like you to grab a copy of The Sinner, on September 27, and share my excitement; because I don’t think Amanda is the only one growing in power here, not anymore. *Thank you MIRA and Netgalley for the DRC.